A window pet door can easily be put together using a patio screen pet door. The screen pet doors are intended to be installed in a patio door screen but there is no reason they cant also be installed in a window screen. If you live in an apartment or condominium you may already have a window opening on to a balcony that you let your pet enter and exit through. Putting window pet doors in the screen just lets the pet come and go as they please so long as the window is open. 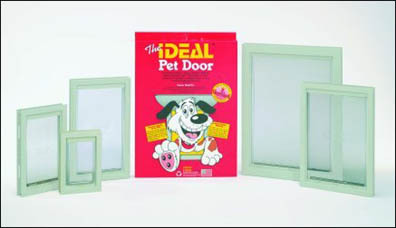 Cats and Dogs can be trained to use a window pet door. Your pet may already have figured out that if it claws a hole through the screen it can make its own door. The window pet doors just make it a little neater by providing a plastic door held closed usually by a small magnet. The pet quickly learns they can push on the flap open the door. The magnet keeps the flap closed so that you still have a working screen to keep the bugs from coming in when the window is open. Window pet screen flaps are best used with small dogs and with cats. The pet doors only have thin aluminum or plastic frames which are not meant to be extremely strong. Theres a lot more wear and tear involved when you have dogs heavier than 20 pounds going through the screen. 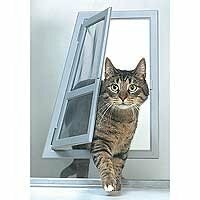 A window screen is also not the strongest place to attach a pet door to in the first place. So long as you are using it with a small animal like a cat, you should be alright. The most intimidating thing about installing window screen mounted cat doors is that you have to cut into a perfectly good window screen to install it. But in all probability, your pet has already clawed the screen anyway. If you do make a mistake, like cutting the hole in the top of the screen instead of the bottom, you have to get your window screen replaced and start all over again. Cutting a hole in the top might seem silly but its an easy mistake to make if you have the screen out of the window and lose track of where the top and the bottom is. So make sure you mark the location of the pet screen door with masking tape or similar. That way there will be no chance of error when you cut the screen. The first thing you need is piece of plywood or a thick board a little bigger than the new pet door itself. I usually sit that down on the ground first and lay one half of the frame of the pet door on top of it. Then the window screen is laid on top of the pet door half and the wooden board so you can line door in the correct position. You do this by moving the window screen around until the pet door lines up with the tape marks you made on the screen. The pet door has grooves all the way around the frame which you use as a guide to cutting out a door size hole in the screen. The thick board gives you plenty of support when you are cutting through the screen. It will help you cut a nice even hole as close to the edges of the door flap as possible. Other doggy doors require you to roll the edges of the cut screen into the dog door frame with screen spline. This can be done with a flat blade screwdriver or more quickly with a screen roller. The spline can be purchase from the screen repair supplies section of your local hardware store. With this style of dog door, once the screen is rolled in, you are ready to reinstall the screen in the window and your door is complete. With the plastic pet doors you have to place the second half of the pet door over the first half and join them together. Once you have the hole cut in the screen make sure nothing moves out of position and place the other half of the door in position and use a rubber mallet to hammer the two pieces together. Its usually best to hammer one corner and gradually work your way around the frame hammering the two pieces together. The pieces are designed to grip each other and no screws are needed. You have now completed your pet door are now ready to reinstall the screen. The plastic pet doors that are hammered together may start loosening up after months of use so you may want to drill holes through the pet door frame and install small screws or nuts and bolts to hold it together. But you should end up with a perfectly useful pet door that your pet can use to come and go as they please.